budget, travel dates & save! Here’s my Masai Mara picture gallery, with some of the best photos of this most popular of all Kenyan wildlife resorts. I think these Masai Mara photos make it easy to understand why hundreds of thousands of North Americans and Europeans visit this wildlife resort each year… At the bottom of this page are links to more Kenya image galleries at this website. What's YOUR best Kenya picture? Above: Sunset at Masai Mara during the famous Wildebeest Migration in the summer, when up to a million wildebeests trekt through the park. 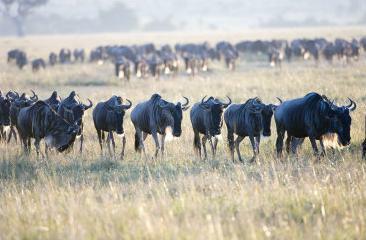 Above: Another picture of the Wildebeest Migration. The animals first gather on the Serengeti plains of Tanzania, and then trek in a big circle through the Masai Mara are and back again. 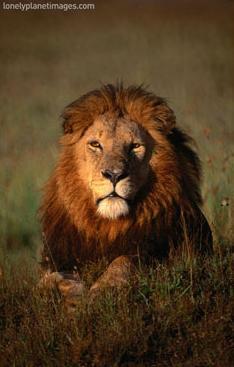 Above: A lion in Masai Mara. One of the reasons why this park is so pouplar, is the big chance of seeing all of the ‘Big Five’ (lions, elephants, buffaloes, rhinos and leopards) in one place. 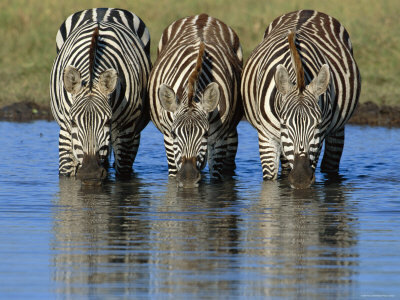 Above: Three common or Burchell’s zebras drinking water in Masai Mara. There are many of these zebras present. They are grazers dependent on water and they trek wherever there’s food. 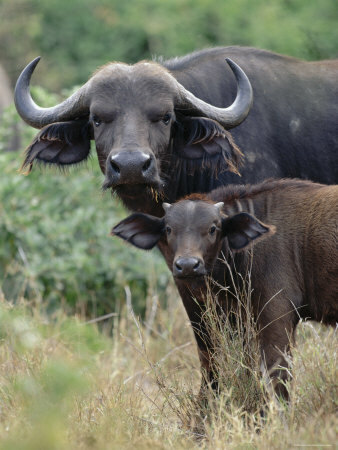 Above: An African buffalo with her young. These buffaloes can sometimes be encountered in herds of hundreds of animals and they often aren’t scared of humans. Above: More umbrella acacia trees in Masai Mara. As the park consists to a large extent of plains, it’s easy to spot wildlife. In parks such as Aberdare or Meru, where the vegetation is more dense, the animals can’t be seen. 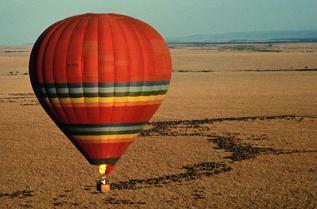 Above: it’s possible to take a hot air balloon trip of a few hours over the Mara. They typically start around sunrise. They cost some $400. After landing, you’ll often get a breakfast with champaign. Sometimes breakfast is even cooked on the balloon’s burner. Above: A giant eland in the park. 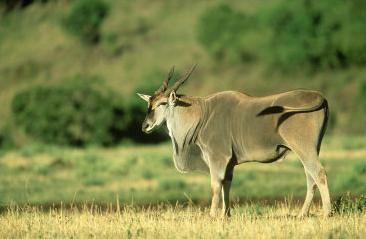 The eland is Kenya’s largest typo of antelope. A female can weigh up to 600 kg, a male up to 1000 kg. Above: Lions consuming their prey. Lions aren’t as brave as their ‘King of the Jungle’ reputation would suggest. 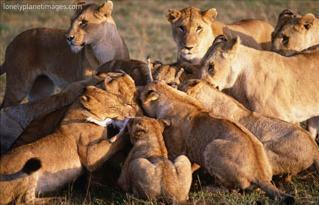 They often hunt in packs and then together jump on one weak or slow animal. They also eat carrion. 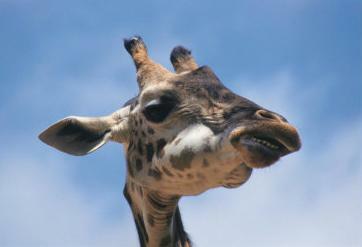 Above: A giraffe in Masai Mara. Giraffes are the tallest of all land-living creatures. Males can even reach 5.5 metres and 1300 kg. 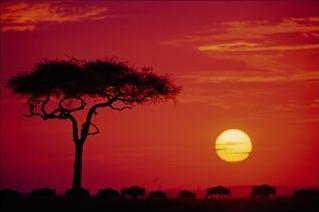 Giraffes prefer grasslands, savannas, or open woodlands and areas where the acacia trees grow. 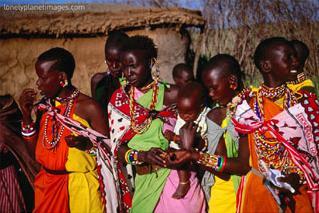 Above: Masai women and children in a village in Masai Mara, Rift Valley. 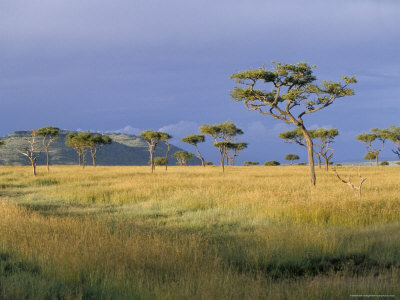 The Masai both live in the Northern Tanzania and Southern Kenya (Masai Mara and Amboseli). The border between the two countries has been arbitrarity drawn up by European colonizers and is artificial to them. Above: Hippos courting in the park. 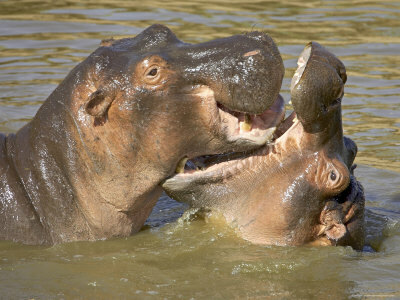 Hippos may seem to be big friendly animals, but in reality they are very aggressive and dangerous. 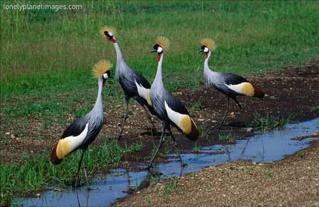 Above: Grey crowned cranes. Normally they typically live in wetlands above 1300 metres. There are over 450 species of birds counted in the Masai Mara park.